Leigh Miners travel over the Pennines to Leeds on Saturday to take on Milford Marlins in Round 16 of the Kingstone Press Cider National Conference League Division One, Kick off 2-30pm on the 4G pitch at Leeds Training Academy. Miners make the journey over to Yorkshire having won their 10th game on the bounce last weekend when they beat Shaw Cross Sharks 44-0 at home. Despite the comfortable victory which saw Miners stay in second two points behind leaders Thornhill and move three points clear of third placed Lock Lane after they lost at Pilkington Recs, the lads where rather disappointed with their performance with ball in hand after they spilled way to much ball throughout the contest and against better opposition they would have been punished. This week the side that is travelling to take on Milford will be looking to build on last weeks strong defensive effort but know with ball in hand they will have to be much better, because if they cough the ball up the way they did last week they will come unstuck against a good Milford outfit. When the two teams met at Twist Lane in Round 10 at the beginning of June, Miners won a cracker of a contest 27-22 in a game which was played in front of the television cameras on FreeSports TV. 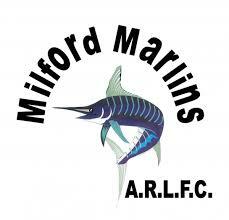 Milford Marlins go into Saturday’s game on the back of a hard fought 32-18 away win at Bradford Dudley Hill last weekend, to leave them in fourth position on 20 points. The Fish have won 9, lost 4 and drawn 2 of their 15 games played this season and are one of only two clubs left in Division One who can still boast about being unbeaten at home in 2018. The second team, Ladies team, u18s and both girls teams all have free weekends.